At the age of 55, the great French actress Sarah Bernhardt, who had already triumphed playing several Shakespearean heroines including Ophelia, decided to take on the title role of Hamlet. 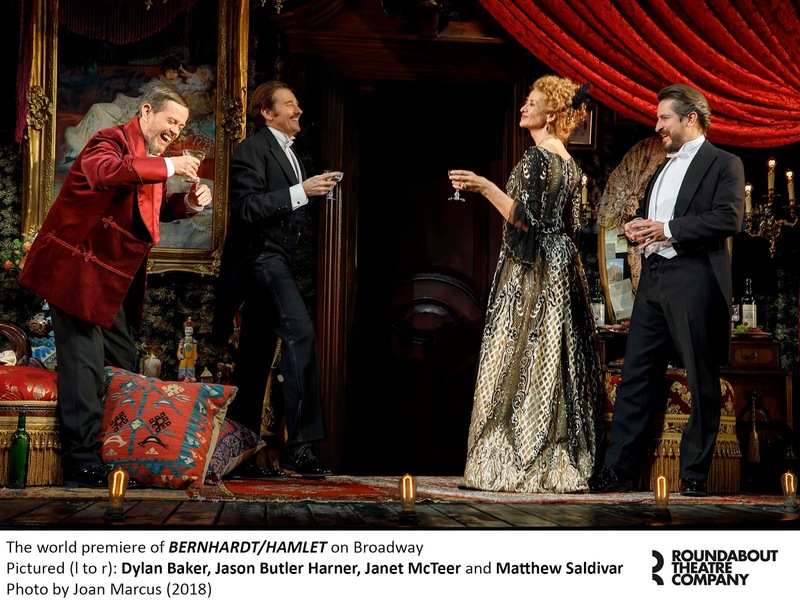 And it is the mounting of that legendary 1899 production that serves as the focus of Theresa Rebeck’s uneven but mostly rollicking backstage comedy/drama. In the second act, Rebbeck shows us the genesis of Rostand’s most celebrated work, “Cyrano de Bergerac,” and we even get a fully-staged scene from that play. It’s a colorful digression to be sure, but one that makes a long play, already juggling a lot of themes, even longer and less focused. Rostand’s wife Rosamund (Ito Aghayere) shows up unexpectedly in the second act and there’s a pretty good confrontation scene, as does Bernhardt’s disapproving but ultimately loving son Maurice (Nick Westrate). But for all its good bits, the play lacks a strong dramatic arc. Still, there’s real chemistry between McTeer and Harner, the latter a strong asset to the production. Other parts are capably essayed by Brittany Bradford, who plays Ophelia in the production, and Triney Sandoval and Aaron Costa Ganis, who at one point, are seen rehearsing the Rosencrantz and Guildenstern scene with McTeer. One of the most compelling scenes shows the rehearsing of the ghost scene between McTeer and Baker. McTeer gives a confident, flamboyant, imperious, larger-than-life performance, as you’d expect. She’s no slouch at taking on classic roles (e.g. Mary Stuart in Shiller’s play, Nora in “A Doll’s House”), but there’s nothing particularly Gallic about her assumption of this role, nor was there in Glenda Jackson’s portrayal in the only fair 1979 film, “The Incredible Sarah.” It’s perhaps unreasonable to expect a great English actress to suggest Frenchness, unless perhaps by affecting an accent, but then everyone in the cast would have needed to do so. Still, that might have been the way to go in order to make the whole more authentically persuasive. Rebeck presents her protagonist as a trendsetting naturalistic actress, which is somewhat contrary to the more declamatory style for which Bernhardt was known. Still, we learn Bernhardt felt Hamlet must be played as a ripe 19-year-old youth. 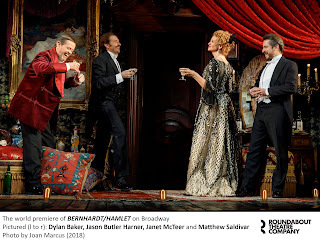 Despite my intense admiration for McTeer, and the promising subject matter, I found the overall tone too jocular, and overly laden with present-day feminist, gender, and sexism jargon, as in tiresome questions about what it means for a woman to play Hamlet. I may be wrong but I don't think historically it was such a big deal for her to be playing Hamlet at the time (any more than it is for Glenda Jackson to take on King Lear as she’ll be doing later this season, or for McTeer to have played Petruchio as she did in the park); Bernhardt played several men's roles in her day. The gambit may raise eyebrows, but not generate outrage. The dynamic between Bernardt and Rostand is intriguing. Beyond their romantic entanglement, he is shown to be frustrated by her demands to adapt Shakespeare’s text. (As we learn, the task was eventually done by other hands.) But, in any case, we never actually get a sense of how this prose “Hamlet” might have sounded, as it would have had to be an English translation of that French text. Director Moritz von Stuelpnagel handles all the backstage activity with panache (to use a “Cyrano”-inspired word), and is adept at staging the considerable comic elements and snappy one-liners of Rebeck’s script. “A woman who does nothing is nothing. A man who does nothing is Hamlet,” Bernhardt quips at one point. Beowulf Boritt has designed a cleverly revolving set with morphs from backstage to cafe to Rostand office to Bernhardt dressing room, all atmospherically lighted by Bradley King, Toni-Leslie James’ costumes are richly designed, and Fitz Patton’s original music and sound design add to the rich period ambience.